Khepri - God of rebirth and the sunrise. - Egyptian God. Khepri Khepera Kheper Khepra Chepri is a God of rebirth and the sunrise. Home ¦ Divinity of the Day ¦ Egyptian Gods and Goddesses ¦ Khepri - God of rebirth and the sunrise. Khepri - God of rebirth and the sunrise. Khepri (Khepera, Kheper, Khepra, Chepri) is a God of rebirth and the sunrise. He is usually depicted as a scarab bettle or as a human male with a scarab as a head. He is the sun-god at dawn on the eastern horizon. 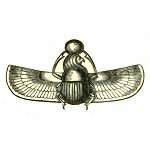 Scarab amulets are found as grave goods, amulets, talismans, jewelry types, or gifts of affection.